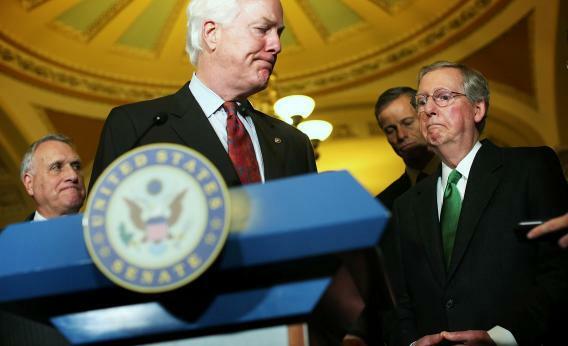 Cornyn debt ceiling op-ed: An outrageous distortion. WASHINGTON, DC - DECEMBER 04: (L-R) U.S. Senate Minority Whip Senator Jon Kyl (R-AZ), U.S. Sen. John Cornyn (R-TX), U.S. Sen. John Thune (R-SD) and Senate Minority Leader Mitch McConnell (R-KY) speak to members of the media. What he’s missing here is that the path he’s advocating is much worse than anything that’s happened in Italy or Spain. He proposing that the federal government simply default on payment it’s obligated to make. We have had, in the past, episodes that have been called government shut-downs. What’s happened in those cases is that no new appropriation bill has been passed authorizing many branches of the federal government to operate. Absent an appropriation, there’s no legal basis for the government programs to be administered and so they aren’t administered. Then congress appropriates new money and things come back. What Cornyn is talking about is something else. He’s talking about the government not paying bills that it’s already obliged to pay. Social Security and Medicare exist. Bondholders are owed interest payments. State and local governments have submitted paperwork to get their grants. Veterans are owed benefits. Contractors have agreed to do work. Congress has passed the appropriations bills. But if the debt ceiling isn’t raised, the Treasury won’t have the money to pay the bills it has to pay. The result won’t be a “shutdown” of government functions; it’ll be a deadbeat federal government. Some people won’t get money they’re legally entitled to. But who won’t be paid? And who will decide who won’t be paid? Does the Secretary of the Treasury just arbitrarily get to decide that bondholders and residents of blue states get paid, but there are no Social Security benefits for Texans? Can Obama dock Cornyn’s pay but not Chuck Schumer’s? Certainly there’s no legal authority for that kind of prioritization, but what’s Obama supposed to do if congress tries to prevent him from spending money that he’s legally obliged to spend. Maybe everyone’s checks will go on time as required (the opposite of a government shutdown) but then everyone’s going to have to race to the bank ASAP because some of the checks are going to bounce. And then what happens? As you know if you’ve ever bounced a check, the mere fact that you don’t have the money in your account doesn’t release you from the legal obligation to pay. The federal government still owes what it owes, regardless of what Cornyn or anyone else says about the debt ceiling. Instead of incurring new debts in the form of duly issued treasury bonds, we’d be incurring new debts in the form of bounced checks to soldiers and and FBI agents and hospitals that treat Medicare patients. When I was in Russia back in 1998, there was a lot of this going on. Government workers just wouldn’t get paid what they were owed. It ultimately resulted in a default, and something like a tripling of the ruble-to-dollar exchange rate.